Delhi always makes me nostalgic. As I passed through Connaught Place recently and saw Wimpy's and Nirula's, I was reminded of a time when it was über-cool to hang out here. A time when this was the closest thing to American-style fast-food and ice-cream parlours in the country. Of going back to Lucknow and talking about the 21 varieties of ice-creams available here. I remember my favorite was called Manhattan Mania, a rich creamy ice-cream cone with glazed fruits and nuts. 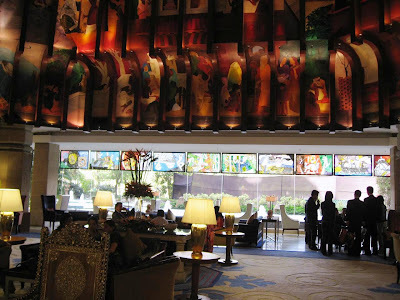 During my early days in New Delhi, the five-star hotels were out of my reach. For me then, the epitome of fine dining was at Berco's in Connaught Place which served Chinese food and we would wait for as long as an hour for a seat. Over the years, I could afford more upscale - and expensive - restaurants, and I remember my first visit to the famous Bukhara at the Maurya Sheraton. Already a foodie, I had heard of this place - especially about how this was the favorite dining spot of then Prime Minister Rajiv Gandhi and many visiting heads of state. That dinner was a dream dinner for me, one that I carried in my memory for a long time. Trying to figure out a place to have my lunch before checking out of the Taj, I was suddenly reminded of the Bukhara, right next door. I wondered if I would find the Bukhara as delightful as that first time. Let me tell you now, there is a reason this restaurant is rated the best in New Delhi by many. 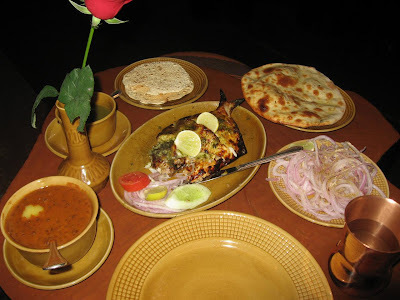 There menu remains the same with a few good kababs, exotic Indian breads and the world famous Dal Bukhara. But no one - no one! - makes them quite like the Bukhara does. I ordered the Tandoori Pomfret, Bharvan Kulcha, and Dal Bukhara. The fish was simply amazing: large, with a moist, flaky interior covered with a crispier outside coating with the best tandoori masala ever. The Kulcha and the Dal were exceptional too; you can’t make them any better. Even the laccha onions they serve along with the food seemed perfect – sprinkled with a zesty chaat masala. I ended with a Phirnee dessert. The phirnee was good, flavored with saffron, but not as delightful as the rest of the meal was. 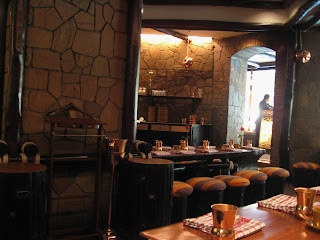 They encourage you to eat with your bare hands at the Bukhara, and trust me, that’s the best way to enjoy a meal here. Bukhara’s décor of a North West Frontier tavern, chain iron curtains, seating made of logs tied with ropes, etc., have now been copied in many restaurants. What remains unique is the large and distinct red-checkered apron they tie around your neck before you begin attacking your meat with your bare hands! 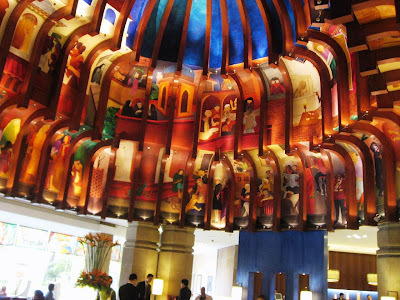 Bukhara was one of ITC Hotels’ first attempt at branded upscale restaurants and was an instant success. 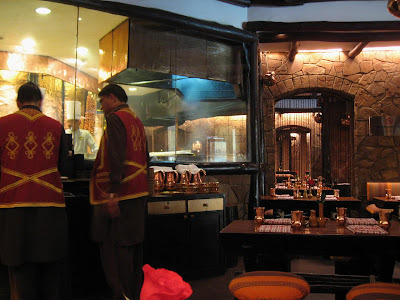 While their other branded restaurants such as the Dum Pukht, Dakshin and the Peshawari have been replicated in their other hotels in Indian metros, there is only one Bukhara – in the Maurya Sheraton at New Delhi. A restaurant Bill Clinton never misses visiting when he’s in town. Bukhara is named after the Uzbek city located on the ancient Silk Route and famous as a center of art, religion and culture during the Persian empire. The invading hordes that came to India from this region brought mayhem and destruction, but also gave us our kababas and biryanis. Like they say, every cloud has a silver lining! I should try out this place the next time i am in Delhi. Haven't been to Bukhara in around 3-4years at least.This used to be the place to go for birthdays in the family(close family I mean).Reason for this long absence has been their not so good food the last time we went there.So we assumed the chef had changed and hence the absence.Anyway whenever we would go we would have a fixed menu. The sumptuous meal would leave the tummy feeling fabulous and the eagerness for the next birthday to arrive soon! Although,there are canned versions of Dal Bukhara but the real experience cannot be replicated. Delhi has grown so much now with no one paying heed to Wimpy's.Nirulas however is great with their ice cream,ice cream sodas etc etc range at Connaught Place. 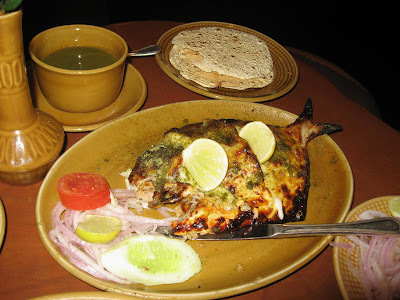 P.S.Your description of the Pomfret made my mouth water. @Manish: Oh yes! There are many imitations, but only one Dal Bukhara. @amreekandesi: Yes, you should. Welcome to my blog! @Tanuj: Thanks for sharing. Haven't ever tried their fixed menu. No its not like its mentioned in the menu as "fixed" but this is what my family would always have.Except once where we also ordered the fish,don't remember which type though.It was good too but then again Tandoori Chicken cannot be beaten! @GMG: Thank you for sharing, my friend! 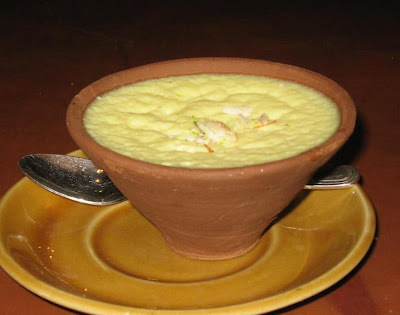 How much does a dal bukhara cost there? The last I went there it was Rs.350, bet its increased by at least a 100 rs ever since.